EDC’s Reinforced Concrete Products for Waterline Square Buildings 1,3 & 4. The transformation of an old Penn Central rail yard into the Riverside Center master-planned community of upscale, residential high-rises has taken two decades. EDC was pleased to assist with the final trio of buildings. The structures, named Waterline Square, broke ground in 2015 and were built simultaneously. Their completion is scheduled for 2019. EDC was selected to provide solutions for the cast in place concrete shoring and formwork requirements with its extensive inventory of frame shoring, post shores, Sonotubes and more. EDC also provided the Screen Saver perimeter protection system on building 3. Inside, the condos and rental units have wide-open spaces free of interior columns. They also feature high-ceilings and floor-to-ceiling windows. Have a high-rise construction project for which you need high-quality supplies and expertise? With our extensive rental inventory and our in-house ability to manufacture customized products, we are your one-stop shop for all reinforced concrete supplies. Fill out our contact form or give us a call at 201-641-2880 to discuss your project with one of our experts. 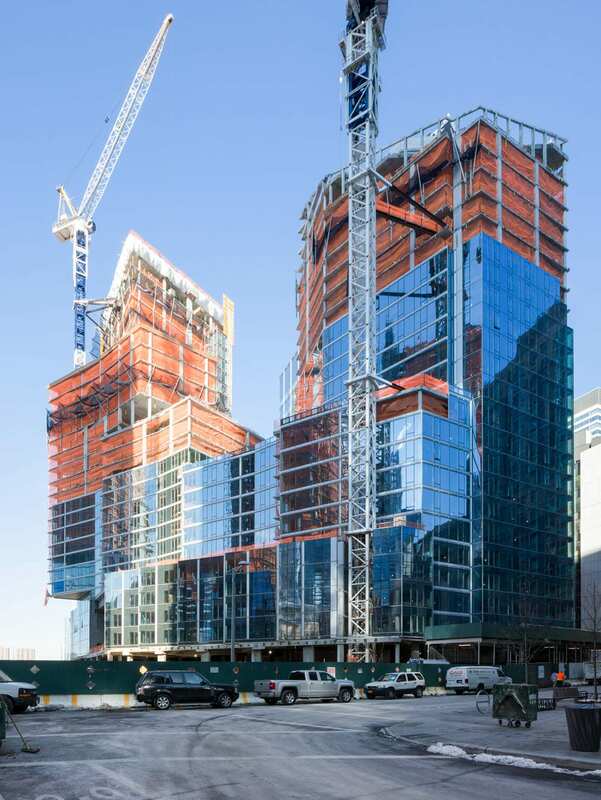 EDC was chosen to provide forming and shoring solutions for the residential skyscraper, providing its formwork, frame shoring, and post shore equipment. 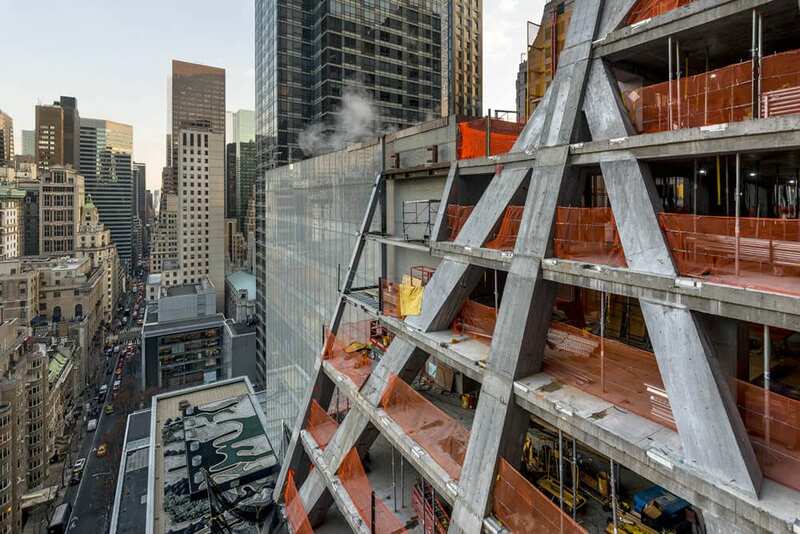 The habitable floors were completed in mid-2018, with the final triangular peak installed in December 2018. The building’s exoskeleton – vertical columns, inclined braces, and horizontal beams – was originally intended to be built of steel. Upon discovering that this would limit the number of the building’s stories, the solution was to use a reinforced concrete system. EDC’s forming and shoring solutions were indispensable, this being the first time that a diagrid of this size and complexity has been made of concrete. Have a complex high-rise project underway? Whether you need custom fabrication, to rent the precise equipment required to do the job right, or expedited shipping of products to a jobsite, we are here for you. Simply give us a call at 201-641-2880 to talk to one of our experts. Construction project photographs by Giles Ashford.